Measure the performance of your admission officers based on the number of enrollments they generate etc. Get enrollment insights, including the number of leads in each stage, and the average time they stay there. Measure how each of your campus locations is performing in terms of enrollments, and revenue. Know the performance of all your communication with prospective students, be it email, text or social. Get a summary of your admission officers' check-in and check-out times, logged hours, vacation days etc. Get reports on the different stages of the enrollment funnel the applicants are in at a given point in time. Know the complete summary of the popularity of different programs, courses and schedules. Always know where you stand in terms of students enrolled against the approved enrollment targets. Identify the lead sources working best for you in terms of the quantity and quality of inquiries they generate, and the student enrollment rates. Get in-depth insights into channels, campaigns, devices, days of the week and times performing the best in terms of inquiry generation. Get detailed conversion analytics for your landing pages and forms. Compare different pages to analyze the ones converting the best. View reports for the same page during different time periods to identify a drop or spike in conversion rates. Measure the performance of your admission officers based on the number of inquiries they are able to handle on time, the number and quality of calls they make, the number and quality of applications they process, and the total number of enrollments they generate. Getting back to the prospective students on time is very important to recruit the best candidates for your institute. 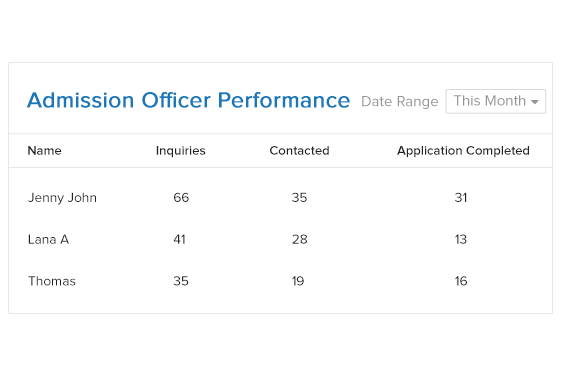 Get insights into the first-response time of your admission officers, both individually and on an average. Use this to create realistic benchmarks for your team. Always know the state your application funnel across different courses, program schedules, campuses and more. This means that you’ll always have an idea of average time spent by the prospective students to complete the application & move to the enrollment stage. Get detailed insights of the course schedules that are getting the most interest from your prospective students, in terms of inquiries, applications, and enrollments. This would help you allocate more resources to the schedules attracting more attention, and take steps if there are shortfalls against enrollment targets. Get detailed analytics on how your different programs and courses are performing in terms of the inquiries, applications, and enrollments. This will help you assess the number of students accepted in each course, and the inquiries being generated for the courses, against approved enrollment targets. Get insights into the popularity of each of your campuses, and assess the ones that are most or least preferred by students. This would help you run campaigns relevant to the campuses where the enrollment targets are not being met. Get detailed insights into all your communication channels, including your social messages, text messages, and email campaigns. Assess open and click rates, the best time and days to send emails and text messages, best-performing subject lines, the devices students use to open your emails and more. Always know how your enrollment funnel looks like, including the number of enrollments against the inquiries across all courses, channels, campuses, curriculums and other parameters. Know the average inquiry to enrollment time for all courses, sessions, campuses and other parameters. This will help you plan your different recruitment campaigns, and run them ahead of time. This also helps you identify courses and programs where you need to nurture the applicants more. Your admission officers have the ability to check-in as they sign in for work, and check-out when their work-day ends. This would help you get detailed reports on the average number of work hours of your admission officers, their vacation days etc., and give the managers a better control over their team. Get detailed insights into the course preference of your prospective students. Know the courses where you are meeting enrollment targets with ease, and the ones where you are struggling. This will help you plan course-specific campaigns with ease. Always know where you stand in terms of the number of students enrolled against approved enrollment targets. This will help you take actions accordingly for any anticipated shortfalls or over-recruitment. Also, measure the performance of your admission officers and different courses.